The other day I dropped a grape and it rolled under the fridge. It’s in Narnia for all I know. I’m a little worried about it. I just can’t find it. I’m a little worried about Christmas cookies. Should I have started making them already? Should I have dozens in my freezer?! But I’m not worried about these cakes. They are super-fun little individual cheesy patties. And let’s be honest, you can’t go wrong where goat cheese and guacamole are concerned. Quinoa is super-healthy, so you can eat these and be worry-free. Whew! Come over! I’ll make them and we can toast the first bites. Make the cakes. 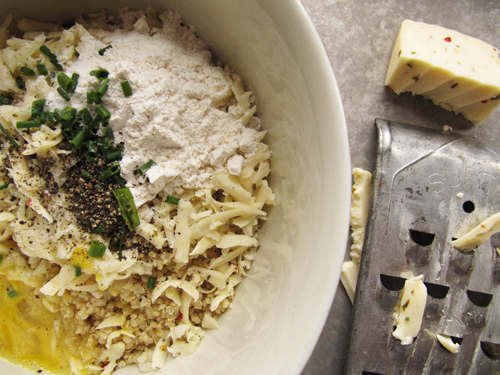 Stir together quinoa, Monterey jack, flour, chives, eggs, black pepper, and salt. Add 1/2 cup of the panko crumbs crushing them as you drop them in. Mix in up to 1/2 cup more crumbs until the mixture is sticky and holds together. Allow the mixture to sit for 5 minutes. Heat olive oil in a large saute pan over medium heat. Form 1/4 cup patties with the quinoa mixture and place in the heated saute pan. Cook on each side for 5 minutes. Repeat until all of the cakes have been cooked. Make the guacamole by mashing the avocados roughly with a fork. Stir in the garlic, chopped tomatoes, salt, pepper, and lime juice. Taste and add more salt or lime juice to taste. Mix in sour cream, if using. 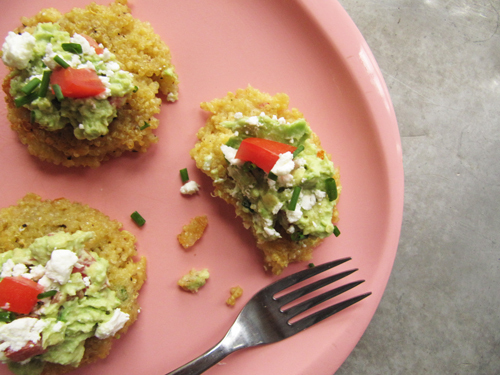 Serve the quinoa cakes with guacamole, crumbled goat cheese, and chives. Three (of these) is not a crowd. 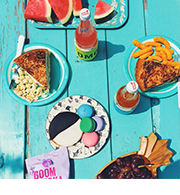 They are the perfect ladylike lunch. These are looking good…and I would like some! Thanks! I bet you’d like them for real. I worry when things roll under the fridge too…I’m afraid they’ll grown into a moldy-monster! but, I bet that grape will just dry up into a raisin. these cakes look so tasty and all things are good with cheese! I know! I don’t want that moldy grape monster to grab my ankle one of these days! And yeah man. Cheese is where it’s at. 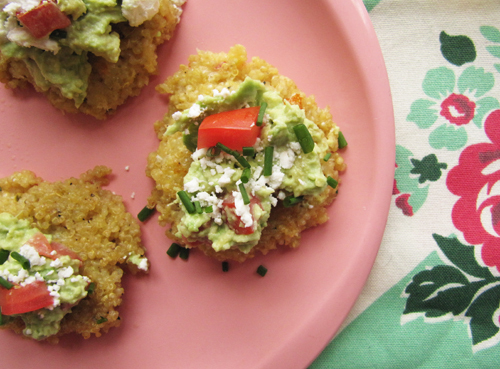 I love goat cheese…and guacamole…and I really want to like quinoa but the texture is so weird! Maybe these will change my mind. I hear ya. 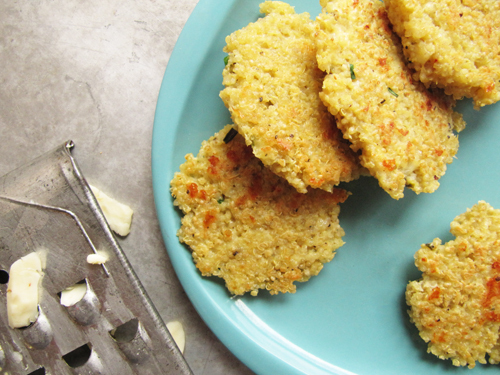 These are still quinoa textured, but the crispy edges and cheese could maybe win you over! Or just eat a bunch of goat cheese and guacamole? I worry a lot too! I will make sure I get that grape… If it really disappeared, I’ll report for possibility of Narnia and worry about that. Really! I could so understand what you’re feeling! A worry-free cake like this one is always welcomed! Oh these would be an awesome appetizer! Good thinkin’. Tried these out. Maybe I did something wrong, but they were a tad greasy. 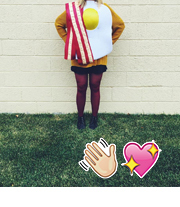 I’m thinking next time I’ll “fake fry” them in the oven. Let’s snack our lives away.